Hopelessly Devoted Bibliophile: It's shaping up to be a SYNC summer! In case you missed it last year, SYNC is back and it's an awesome program! Each week during the summer, between July 1st and September 1st, popular audio book companies offer up FREE titles for you to listen to! Now if you are participating in an audio book challenge like I am (maybe over at Bewitched Bookworms or Teresa's Reading Corner) this is a great chance to do some listening for free! 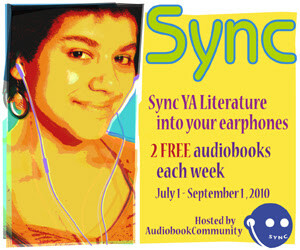 To participate, just head over to the SYNC headquarters and download your first pair of books. You can also text syncya to 25827 to receive text message alerts that let you know when new books are up. Not to worry, I did this last year and they don't send you spam :). Enjoy, and happy summer reading/listening!